There’s nothing quite like being able to market your tax or accounting practice while also doing something wonderful for someone else. 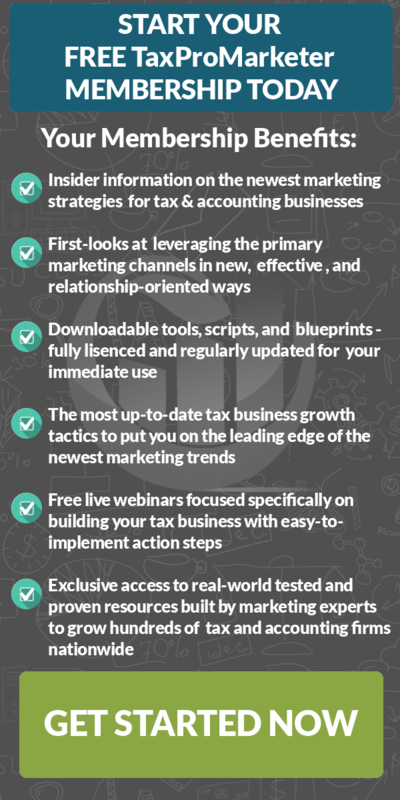 Because as tax season approaches, it’s time to start compiling the list of strategies you’re going to put into place to GROW in 2015 and beyond. It shouldn’t be a short list. As Dan Kennedy used to say: I can’t think of 1 way to bring in 50 new clients, but I can think of 50 ways to bring in 1. This should be your mantra, as you plan. Next week, I’ll have some further thoughts on strategic planning for your marketing, and we also have some great news on the “direct mail” front that I’m eager to share with you soon, as well. Fall and winter are the perfect time to consider hosting a food or clothing drive, for example. With the weather getting colder many people have difficulty affording weather-appropriate clothing, not to mention the added expense of heating their homes. With the holidays coming up, many are also wondering how they will be able to purchase a few gifts for their children and other loved ones or to travel for family get-togethers. A great way to market your practice and really make a difference is to raise goods or funds for people in these situations. Food banks and other nonprofit organizations that serve the needy are also very stressed at this time of year, so you could even partner with one of them to help get the word out. Speaking of partnering, why not reach out to your contacts, especially businesses, and invite them to host the charity event with you? This gives them the opportunity to also promote their organization and can really strengthen their relationship with your practice. It’s like doing multiple forms of tax marketing all at the same time. Once you’ve determined what kind of event you’d like to do, make sure to get the word out. Pass out flyers, complete with information about how to get involved (and your firm’s name, of course). It’s also a great reason to reach out to past clients in order to let them know about the opportunity to connect. Not only will they get a little reminder that you’re out there, but they’ll also realize that your firm is involved in the community in positive ways. It probably goes without saying, but these types of events shouldn’t be all about marketing your tax business. Raising the funds or collecting donations and getting them to those in need should always be the highest priority. While you can reap the benefits of name recognition and fostering good will, the marketing aspects of a food/clothing/etc. drive should be secondary to actually helping the cause you’ve chosen. If you don’t have the time to coordinate an entire event, consider joining in someone else’s. For example, your law practice could co-sponsor a fundraiser or you could make your office a drop-off site for Toys for Tots or a similar charity. You get to do a good deed, and the organizations actually do some of your tax firm marketing for you. Typically, I’m not much in favor of “sponsorships” … but here’s the other thing that thinking like this accomplishes: You get past the small-minded tyranny that YOUR problems, YOUR cashflow and YOUR business is what matters most. Look, I hate the smarmy wishy-washiness of “the universe is waiting to give you what you CLAIM” — but the fact remains that when you signal to your soul that money does NOT control you, that you are able to give (generously) of your resources, your name and your contacts … well, it actually is amazing how those things do return back to you, often with friends attached. So take some time to consider integrating giving into your plans to receive new clients to your firm… you won’t regret it.